According to its website, LinkedIn is now the world’s largest professional social network. However, it’s much more than simply a platform to post your resume and collect professional contacts. LinkedIn Groups, a subset of LinkedIn based on people with common interests on a variety of topics, focuses professional networking to groups of your peers. Out of the hundreds of millions of people using LinkedIn on any given day, you can specifically target people you’re interested in based on the LinkedIn Groups to which they belong. If you have an audience you want to interact, discuss, and engage with, chances are they’re already in a LinkedIn Group. 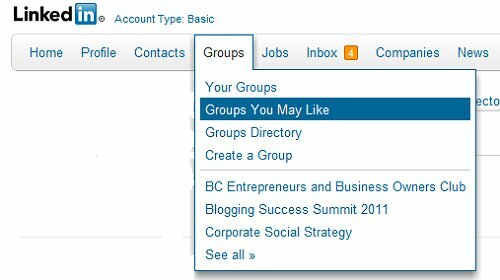 To find a specific Group, navigate to LinkedIn.com , click the “Groups” tab and then “Groups You May Like”. Based on your profile information, you’ll be served with a list of suggested Groups. You’ll also find subgroups in this list; they function just like regular Groups, except they have a parent group and were originally subdivided from there. You can also search for Groups in the left-hand navigation of the “Groups You May Like” section. You can search by keyword, category, and language. Another way to find Groups is by clicking on the “Groups Directory” tab where you’ll find a list of featured Groups. Many LinkedIn Groups are set up to only accept members who are relevant to the Group. For example, a Group discussing children’s media will accept members with some experience or interest in that area. Other Groups are open and will accept anyone who joins. An open Group can be subjected to less-focused subject matter. For example, if you are in a number of social media Groups, you may find the same members posting the same conversation across multiple Groups. However, if you choose to join more closed Groups, you may find the manager of the Group will work to keep the conversations focused and relevant to the topic. When you’ve joined a Group, you’ll want to start Discussions to get your name, face, and links out there. The LinkedIn Group Discussions are set up to encourage sharing links. When you click on a Group you want to engage with, the first thing you’ll land on is the Discussions tab. Near the top of the page, you’re presented with a place to enter some text and a link to kick off a Discussion. This is a great place to create conversations around your content and what you want to promote. Make sure the content of your link is relevant to the group you’re posting to in order to get the best responses and click-throughs to your content. To find existing Discussions you want to get involved with, browse through “Latest Discussions” and “Most Popular Discussions” also featured in the main area of the Discussions tab. Further to that, the manager of the Group has an area for a “Managers’ Choice” Discussion on the right-hand side of the page. Also featured in the Discussions tab is Group activity from the last seven days on the right-hand side of the page, and a list of the Group’s Influencers. Influencers are those Members who post and respond most often in this Group. The next tab in a Group is the “Members” area. Here you’ll find all Group Members sorted by their relevance to you. For instance, you’ll see your name at the top of the list and from there you’ll see those most closely connected to you, starting with people in your own network (if they’re in your group). On the left-hand side of the Members tab you can search for other Members and see who’s joined in the previous seven days. Knowing that Groups are a place to do business, LinkedIn has also added a more direct area to market your products. The “Promotions” tab is an area many LinkedIn members use to promote sales, events, and products. The “Jobs” tab is divided into two sections. Employers can post opportunities related to the Group in the “Career Discussions” area. LinkedIn has a formal Job area where you can pay to be listed and searchable in their job database; the Groups Jobs tab pulls relevant data from the bigger Job database. The next tab in a LinkedIn Group is “Search.” You can search through all types of content of the Group in this area. Finally, the “More” tab of the Group offers an area to browse all Group updates, see your activity and settings, see any subgroups created from this Group, and read the Group profile information. Should You Create Your Own Group? LinkedIn will let you join up to 50 Groups, but it’s probably most effective to find three or four Groups you can contribute to and comment on meaningfully. Since there are hundreds of thousands of LinkedIn Groups, chances are you’ll find a few that work for what you want to discuss and promote. There are few limitations to the content of the Group you can create; it can be a professional or networking Group. You’re asked to provide an image, group name, description and choose whether or not your group will be open or by request to join. LinkedIn Groups can be a great way to bounce your ideas off of different people, get suggestions, or simply ask a question. 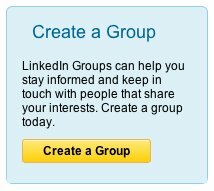 Start by joining a few of the suggested Groups, reading some of the discussions, contributing, and seeing how it LinkedIn Groups can benefit you.